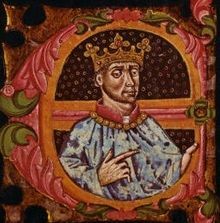 Henry IV of Castile (Castilian: Enrique IV) (5 January 1425 – 11 December 1474), King of Castile, nicknamed "the Impotent", was the last of the weak late medieval kings of Castile. During Henry's reign, the nobles became more powerful and the nation became less centralised. However, in 1468, at the age of only 14, Alfonso died, most likely from the plague (although poison and slit throat have been suggested). His will left his crown to his sister, Isabella, who was asked to take her brother's place as the champion of the rebels. Shortly thereafter at the negotiation of Toros de Guisando, in which she and her allies received most of what they desired, Henry agreed to exclude Joanna la Beltraneja from the succession, and to recognize Isabella as his official heir. Though Henry continued to resist this decision when possible, his actions were ineffective, and he remained at peace with Isabella for the rest of his reign. Isabella became Castile's next monarch when he died in 1474. ^ Iglesias Rodríguez, Juan José; García Fernández, Manuel (1995). Universidad de Sevilla (ed.). Osuna entre los tiempos medievales y modernos (siglos XIII-XVIII). p. 79. ISBN 9788447202218. ^ Álvarez Palenzuela, Vicente Ángel (2007). Editorial Ariel (ed.). Historia de España de la Edad Media. p. 777. ISBN 9788434466685.